Have you ever wanted to take your baby out for a camping trip in the woods but don’t know how to prepare properly? Worried that your regular diaper bag just isn’t going to cut it? That’s why we’re here to help you out by providing you with the details you need to find the best baby hiking backpack for all kinds of journeys. Put aside that school backpack, that just isn’t going to cut it. Instead, consider a bag that’s perfectly constructed to carry everything you need while still being comfortable and stylish. Make it easy to carry around your toddler while keeping your hands free and still having extra storage for those smaller items. Forget about wearing out your arms or having to invest in a rugged, all-terrain stroller just to get through a hike in the woods. Consider a backpack to keep you active without having to worry about your child falling down or walking to slow when you’ve really got to go. However, purchasing a baby hiking backpack can be rather tricky. Thus, we have prepared a guide on what you need to know about baby hiking backpacks and their features. Also, we have reviewed a number of products that should be worth your time and money. Let’s take a look! Before you can go out and find a bag that you think will accommodate your child, you need to know what you’re looking for first, and that means investing some time into examining the features that they come with. It may seem like a simple purchase, but there’s more to baby hiking backpacks than you realize. Instead of guessing your way through the task, why not take our advice into consideration and pore through these features before investing? One of the most important considerations in choosing the right carrier for you is the size and weight of your child. For newborns and small toddlers, you’ll want to start with frameless infant carriers that secure your baby to your chest and allow you to tote some gear up to a total of approximately 30 pounds. 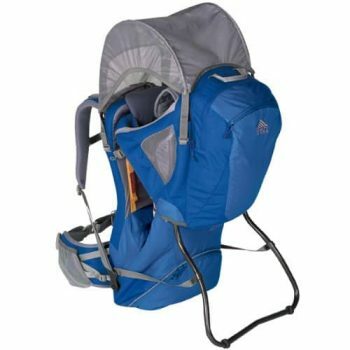 Keep in mind, however, that your child will size out of this carrier pretty rapidly, so unless you plan on doing a lot of hiking during your babe’s first six months or so, you might want to wait until it can be comfortably and safely held by a larger child carrier that will be suited to take her trekking for at least a few years. That frame of the backpack/carrier is a key component to a child carrier, providing structure and support for both you and your mini-me. Most carriers sport external aluminum or steel frames that enable the pack to carry more weight and add to the pack’s overall durability. Frameless carriers are best suited for smaller, lighter, and less fidgety infants, but won’t help to alleviate any strain from your back when you require a much-needed break. However, the one benefit that they do have is that they’re much easier to fold up and pack away in another bag when they’re no longer in use. Keep in mind how you’ll be traveling and what you’ll need to allocate space for so that you can get a backpack that most suits your needs. You also have to make a choice between internal and external frames on your backpack. Internal frames do look more stylish and are easier to zip up when they’re not in use. There’s also the added benefit of the added day pack to store additional supplies. However, the drawback to this kind of frame is that they don’t come with kickstands and don’t have a lot of additional storage already on the pack, save for the day pack. External frames, on the other hand, come with a lot of straps and can stand up while you load your child in. The frame will also suspend your child away from your back so that there’s increased air circulation. On the downside, they’re a lot bulkier, so you have to plan what you’re going to pack into your car wisely. A child carrier’s suspension system is actually designed to provide comfort. Many carriers feature a ladder system of adjustable suspension to allow you to choose what feels best without minimizing any of the space you need to carry your child in . You’ll need to be familiar with how to accurately measure your torso size, which will directly relate to how you adjust the suspension. You can use trial and error, or you can get assistance from someone in the store to help you figure out what works best for your height. Be wary of a carrier that offers a non-adjustable, fixed suspension. Fixed suspension may make for a lighter carrier overall, but you’re signing up for a carrier designed for one-size-fits-all torsos, and not many of us have one of those. Everybody knows a kid’s prime directive is to do the exact opposite of what you want them to do, which is why you’d better believe your child carrier needs a superior harness system. Just like a good car seat, a good child carrying backpack will come equipped with a safe and adjustable five-point harness in order to keep your child in place while still providing them with enough freedom to look around and see their surroundings. Be sure to adjust the harnesses accordingly so that they’re neither too loose nor too tight on your child. Invest some time into looking at these accessories so that you can make the most out of every dollar. Adjusting your fit: The suspension system should be adjusted so that the hip belt rests on your hip bones, and the shoulder straps rest on your shoulders. They should be adjusted accordingly so that 80% of your child’s weight is carried on your hips, while the rest is carried by your shoulders. This will reduce back pains and shoulder aches at the end of the day. The strap around your chest should be adjusted until it’s snug, but not too tight. Adjusting your child’s fit: Be sure to loosen all straps and employ the kickstand before placing your child in the carrier. After your little one is seated in the carrier and all feet and legs are in place through the proper openings, fasten and tighten all straps to be snug but not overly constrictive. Double check the shoulder straps and lead straps (if available) to ensure that they are secure but comfortable. With all of that said, it’s time to take a look at the best products on the market to take care of your needs. You’re not obligated to purchase any of the items listed below, but they do serve as a good starting point when it comes to finding a baby hiking backpack that has a lot of features, without being overly expensive. Here are the best baby hiking backpacks/carriers you’ll ever find. 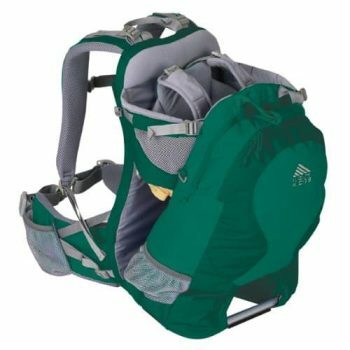 The Phil&Teds Escape Baby Carrier is a great choice for parents who are looking to get the next generation out on the trail as soon as possible. Thought this baby carrier has a lightweight aluminum frame, it’s suitable for children aged three months to three years. Outfitted with washable fabric—a must for parents of small children—this carrier also keeps the hiker in mind: the Ergo Fit Lumbar Control belt comes with extra padding to provide cushioned support for mom and dad’s back and hips, and the Body Tech Fit and Slide Adjust Harness back and shoulder straps are both sturdy and breathable. Your baby will be safe and sound with the five-point safety harness, foot stirrups, and moldable head and neck support, and the included diaper changing mat, convenient dual access pockets, and H2O sleeve will make your family outing enjoyable for adventurers of all ages. Related: Because of baby’s delicate skin, it’s very easy for them to get sunburned. Protect their faces as well as their eyes from the harsh rays of the sun with the i play. Baby & Toddler Swim Hat. It’s machine washable, available in a wide range of colors, and has a neck flap that will keep away not only the sun’s rays, but also any biting insects that will harm your baby’s comfort. The Kelty Journey 2.0 Kid Carrier is better suited to an older baby, with the minimum child weight coming in at 16 pounds and capping off at 40 pounds. But the pack itself is designed to carry a total of 50 pounds (child, gear, and pack), which is no small sum. Luckily for the adult tasked with toting this backpack, this backpack comes with an adjustable suspension system, padded back panel, curved and padded shoulder straps, padded and contoured waist belt with torso-length adjustment, sternum strap, and load-lifter straps to ensure maximum load bearing and comfort. A parent clearly weighed in on the design of this carrier, with its clever under seat storage, loops for carrying toys (undroppable toys! What a revelation! ), removable and washable chin pad (drool, begone! ), and front storage pocket. Kelty has proved itself to be a favorite among outdoor loving parents who want to take their children along on adventures without abandoning the marvels of modern baby gear. Related: With your child on your back, it can be difficult to see if they’re okay without taking the carrier off altogether. However, the Chums RearView Mirror can help you keep an eye on your little one while you’re still on the go. It is included on the body of a carabiner so that you can store it on your belt loop, and can easily be removed to see what your child is up to during your hike. Years of expertise and research have gone into the Deuter Kid Comfort Air Child Carrier, and “comfort” is indeed a priority with this carrier. The Aircomfort back system provides ultimate ventilation to prevent against the dreaded sweaty back on long hikes, and mesh material on both sides of the child seat ensure a substantial flow of air to keep your little traveler feeling cool and calm. 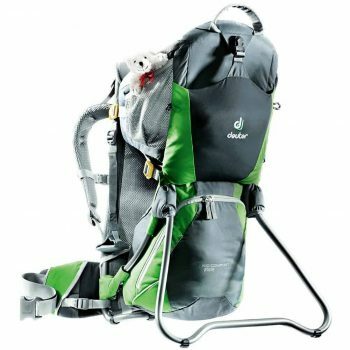 This pack offers a wealth of adjustable options: the shoulder harness, five-point safety harness, child seat, foot rest, Vari Fit back piece, and hip belt are all fully adjustable to fit each hiker perfectly. Perhaps one of the most remarkable features of this backpack is the side access entry which allows your little one to climb in and out of the adjustable seat independently and with ease, so you don’t have to constantly be helping them in, saving you on some back pain. Related: It’s inevitable that your child is going to nod off at some point, so why no keep them comfortable with the Deuter Chin Pad? Not only will it prevent any unnecessary neck strain, but it will also soak up any drool that may appear while your child is napping. It’s extremely soft, made with material that won’t cause abrasions on your child’s skin, and is completely machine washable. Like its cousin the Kelty Journey 2.0, the Kelty Junction 2.0 Child Carrier is a smaller, scaled-down version of that maintains all the features parents love while providing a simpler version of Kelty’s other carrier options. Parents can still take advantage of the Junction’s torso length adjustment system to customize the pack to the wearer (this pack fits torsos between 14 and 18 inches in length), and kids will ride along in comfort in its padded seat and adjustable five-point harness. With all its convenient pockets, toy loops, and water sleeve, this carrier is a great choice for short, casual hikes or urban adventures at the zoo, park, or museum. Users report that the Junction is not as breathable a carrier as some other packs on the market, so you might want to consider another option if you’re headed out on a long summer hike or outing in desert heat or high humidity. Related: Forget about your child suffering with the heat and the harsh rays of the sun; keep her protected with the Kelty Frame Sun Hood. This can be attached to a select few of Kelty’s baby backpacks, and has a mesh window that allows your child to be observant of the great outdoors. It attaches easily with the hook and loop attachments on the corners, to ensure that it’s secure. 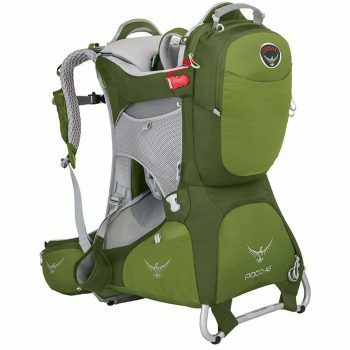 The “AG” in the Osprey Poco AG Plus Child Carrier ’s name impressively stands for “Anti-Gravity,” and the manufacturers of this carrier back up the claim with a lightweight aluminum suspension system and mesh shoulder harness and back panel. The “Fit-on-the-Fly” hip belt is easily adjusted to fit whoever is hauling the kiddo, and a removable day pack can be given to another member of the hike to lighten the load. This product prides itself on being exceptionally safe and comfortable for your little hiker; the fully framed child seat is padded and features a fleece covered butterfly harness and built-in safety leg loops. A locking foot bar kickstand provides extra stability to the wide base when the pack is on the ground, and there are also two reinforced grab handles to ensure a solid grip when lifting or lowering your precious cargo. 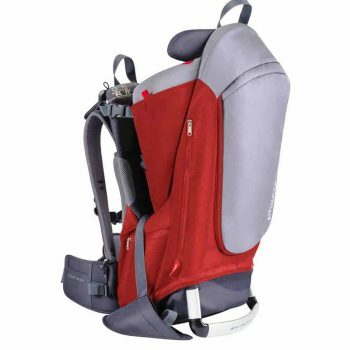 Related: Instead of lugging around water bottles, you can keep your hydration right with you in your child carrier with the Osprey Hydraulics Reservoir. It slips comfortably into the sleeve of the backpack, and provides 1.5 litres of clean drinking water for both you and your child. It’s also easy to remove and carry when you need a refill, so there’s no risk of spilling. The Chicco Smart Support Backpack has loads of desirable features when it comes to choosing baby hiking backpack. 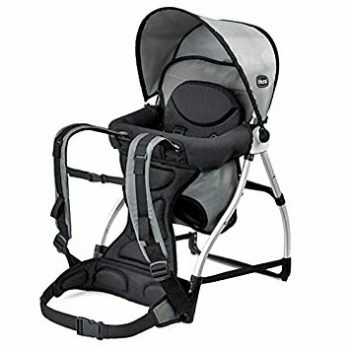 From the aluminum frame and kickstand to the water-resistant canopy and sun visor/rain cover, this carrier has all the basics covered to keep your baby comfortable and happy. However, user reviews stress that this pack is not a good first choice for demanding hikes or long-term wear. This backpack is lacking an adjustable torso feature and users report that it feels as though all the weight is carried in the shoulders (instead of being distributed between the shoulders and the hips). Additionally, the fabric of this backpack is not washable; stains must be spot-cleaned with cold water, which might be challenging in those messier diaper fail or upset tummy situations. That being said, this pack does with a removable fanny pack and cell phone case that can be detached and taken on the go whenever the little one is let out and about to stretch her legs. Related: You’re not the only one that’s going to get thirsty on your trip; by packing the BooginHead SippiGrip Cup Holder, you can take along any container your child prefers drinking from. It has a patented grip material on the inside of the lip that ensure the bottle won’t fall out, and clips easily onto the loop of your backpack or even the child’s beltloop. We hope that you’ve had a lot of fun with us exploring the important features and top rated products in the market. It may seem like a lot to take in, but it’s all for the comfort and safety of your child while you’re out in the great outdoors. Are you a parent who has taken to the trail with one of the backpacks featured in this article? Do you have a favorite carrier that was left out of the short list? Or are you a soon-to-be parent looking for more advice on purchasing your first hiking-friendly baby carrier? Let us know all about it in the comments! TOP GEAR PICKS Best Solar Phone Charger: Which Is Your Best Option for Emergency Situations?